When we last left off in the front yard, Greg and I had rented a sod cutter and removed grass up to this point. I wanted to stay outside of the drip line of the dogwood tree, hence this abrupt halt. Because I had things to do, like buying pots and going to Disneyland, it's sat like this for over six weeks. The weeds decided to have a rager while we were gone. Just wait until their father hears about this. I had to dig down the soil here because it was sloping toward the house. Back when we removed the cement slab in the backyard, the bobcat was driven through this area, badly compacting the soil in the worst way. So I had to dig down several inches and grade everything away from the house. Then I had to remove the sod by hand from the rest of the areas where the pathway would go. For the record, I'm sick of removing sod. Then I had to grade the soil away from the house there, too. For the record, I'm sick of regrading soil. Faced with yet another large pile of dirt, my first thought was, "I should just buy a bunch of pots." That's more fun than transporting the dirt to the truck, then to the soil recycler. 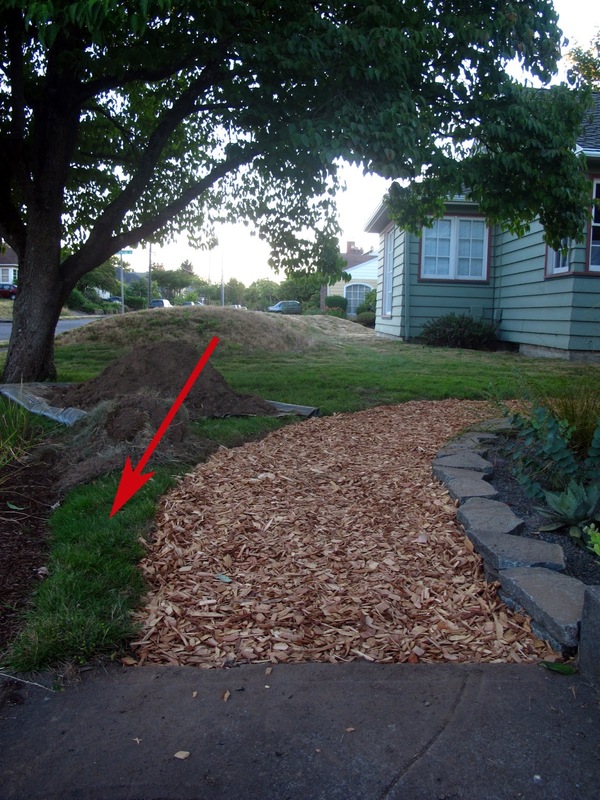 One yard of cedar chips filled the area perfectly. I still need to install rock edging on the other side of the pathway and figure out how I'm going to plant the area between my yard and my neighbor's lawn (if anyone has ideas, I'm all ears). The whole thing looks kind of haphazard right now but at least it smells nice. It doesn't help that we're still missing a board from the gate and the posts still need to be cut down, and the rock wall got knocked askew when the sod cutter went through here . . .
Because I'm an awful person, I left this strip of sod that will be impossible to mow (have fun, Greg!). I could've removed it but I was tired and hot and the debris bin was full. All of these details need to wait because it's supposed to be in the 90s this week, which means I'll be crouching inside by the A/C register, whining about being hot. It's hard being this much of a weather wimp. That mean little strip of grass... Do what I did early on , I just flipped over chunks of sod and planted on top ...the lazy way . Details can wait until it's more comfortable to work outside. For now, I wish you strength as you avoid the death star and it's rays by hiding away by your air conditioner! I wish I had half as much energy as you do. All of my sod would be gone by now instead of 2 feet at a time. Enjoy the AC. It's good weather for reading gardening books, blogs, or planning next year's changes. The couple of times I've tried that the grass has come back to life. Am I not using enough mulch? I think I need a fainting couch. I really think it would help. HAHAHAHA...omg, that strip of lawn is the best thing ever. You wanna come over and mow it? I can only say, that when you are tired of removing sod you are tired of life. 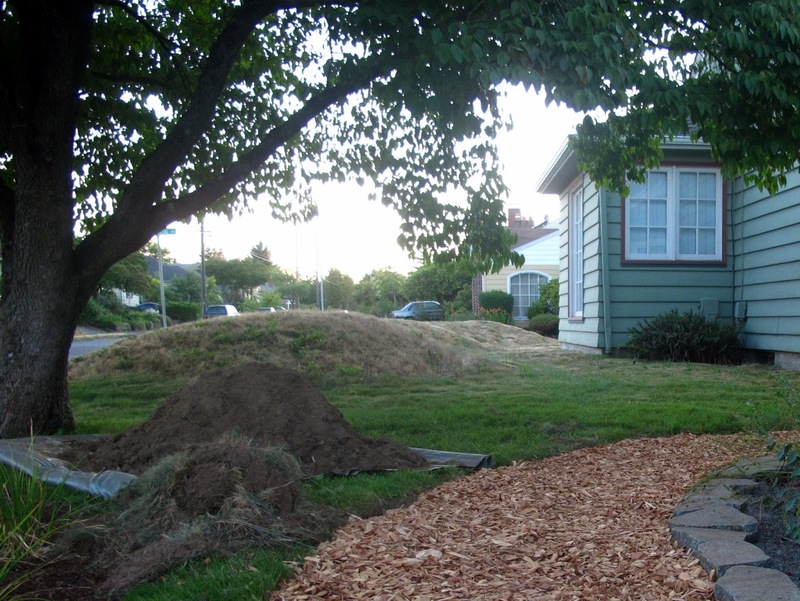 On the other hand, you could just cover that little strip with cardboard and put some different-looking mulch on top, and then some containers on top of the mulch.Eventually the sod will die and the cardboard will degrade, but it will take a couple of years. Heather, why haul away soil? Do you have to pay to dispose of it? Just put soil at the curb and post to Craigslist! Thick layer of newspaper under the mulch should do the trick. I would get a small bottle of Roundup from the Hardware store and spray the grass. It will die in a week. Then cover with mulch and plant some nice Ornamental grasses. I know I can get rid of it that way but I'm too impatient to have everything gone! Ha! I love your philosophy. Because of all the neighborhood cats, I have sworn off newspaper and cardboard smothering--they uncover it and it looks terrible. It's the pickax for me. All mowing partners need these little tests of their devotion.